Thank you, Michelle, for writing this thought-provoking post.Michelle writes:4 Zinas, by Martha Sonntag Bradley and Mary Brown Firmage Woodward, is a matrilineal family biography that chronicles the lives of four generations of Mormon women, all sharing the same name, through settlement in western New York in the early 1800’s, to the early days of the formation of the church, through polygamy and the migration to Salt Lake City, to the colonization of Alberta, Canada, and far into the 1900’s with the final Zina who was wife to Hugh B. Brown. Using letters and diaries, the authors piece together an amazing account of these women’s lives in both grand scope and everyday detail that also sheds great light on the historical events and context of the time in which they lived. Although the lives of each of these women is interesting and notable, I was particularly taken with stories of the second and third Zinas who lived during the period the church practiced polygamy. I found many interesting, intriguing, infuriating, and sometimes surprising bits of information about polygamy and its practice. The life and marriages of the second Zina, Zina Diantha Huntington, suggests a byproduct of polygamy that I hadn’t much considered, and that is: Polygamy strengthened the hierarchy that existed between men of the church. Although the leaders of the early church enjoyed immense social status and renown, the practice of polygamy served to reinforce, and to even strengthen, their position and place in the church. I know that drawing a general conclusion from one specific case is fraught with peril, and I am interested in doing some more research to see if this was an isolated case or if other men were similarly impacted by polygamy. I found this portion of the book so interesting that I am going to mainly rely on Bradley and Woodward’s work and simply convey the story to you. At age 18 or 19, shortly after her mother’s death, Zina Diantha Huntington was secretly approached by Joseph Smith with the invitation to become one of his plural wives. Although she was circumspect in her recording of the events, we know that Joseph approached her at least three times, pressing for an answer, but she would not submit. At the same time, she was courted by Henry Jacobs, a family friend and active member of the church. In 1841, Zina married Henry. Although he had consented to marry the couple, Joseph Smith did not appear at the ceremony and Zina reported that he later explained to her, “he couldn’t give one man [a woman] who had been given him by the Lord. The Lord had made it known to him that she [Zina] was to be his Celestial wife” (p. 112). Soon after her marriage to Henry, she became pregnant and was happy in her new marriage. However, in the months before Henry and Zina’s son was born, she continued to be tormented by the idea that she had gone against the Lord’s will by refusing to follow the counsel of Joseph. Six months after her marriage to Henry, Joseph sent a message to Zina by way of her brother Dimick. “Joseph said, Tell Zina I have put it off and put it off until an angel with a drawn sword has stood before me and told me if I did not establish that principle [plurality of wives] and live it, I would lose my position and my life and the Church could progress no further” (p. 113). However, by the time they married, Joseph had married at least three other women besides Emma. I’m not sure of the exact timing of these other plural marriages, but this statement seems to imply that he hadn’t yet established plural marriage at the time he was pressuring Zina to marry him. I was troubled by this and other instances where men of great authority and power used their positions to persuade women to enter into plural marriage. How hard would it be to refuse Joseph with the thought that by so doing would stymie the pursuit of Zion and would cause Joseph to lose his place as prophet? Zina did not keep Joseph’s request from Henry, although it is unclear when and how he found out. Both Henry and Zina were convinced of Joseph’s prophetic mission, and considered this request a test of faith. Zina records she obtained a testimony for herself that God had required plural marriage to be reestablished. She then states, “I made a greater sacrifice than to give my life for I never anticipated to be looked upon as an honorable women by those I dearly loved” (p. 114). Her testimony of polygamy seemed to be largely based in her belief in the prophetic mission of Joseph Smith and her sense of the importance of obeying prophetic counsel. She remained an ardent supporter of plural marriage throughout her life. Because polygamy was as yet secretly practiced in the church, Zina continued to live with Henry and several months after her marriage to Joseph, their son Zebulon was born. Henry served at least eight missions between 1839 and 1845 and remained devoted to Zina and the church, in spite of the sealing to Joseph. Perhaps at Joseph’s death, Zina thought that she could simply revert back to her marriage with Henry. Indeed, after Joseph’s death and Henry’s return from a mission, Zina and Henry conceived another son who was born in early 1846, Theirs had been a civil union, and there was no dispute that it was a legitimate and legal marriage. However, in Nauvoo, one way in which civil marriages were dissolved was by an eternal marriage that overrode previous marriages without the necessity of divorce. Thus, by this logic, Joseph’s marriage to Zina took precedence over Henry’s. There are several instances where both Joseph and Brigham Young took plural wives who were married to other men, evidently based on these beliefs. Before his death, Joseph requested that the Quorum of the Twelve marry and care for his widows and after his death, his many plural wives remarried Brigham Young, Heber C. Kimball, or others, but for time only. Thus, they served to act as proxies for Joseph Smith, to protect his eternal wives for him. Brigham Young later elaborated on some of the intricacies on marriage and divorce. He described that a woman could not be freed from a temple sealing “while her husband remains faithful and magnifies his priesthood before God, and he is not disposed to put her away….However, if a woman can find a man holding the keys of the priesthood with higher power and authority than her husband, and he is disposed to take her he can do so, otherwise she has got to remain where she is. In either of these ways of separation, you can discover, there is no need for a bill of divorcement.” Perhaps it is by this logic that Brigham and Joseph feel they can trample upon the agency of Zina and Henry (as he was a man with lesser authority and position) and deny them the opportunity to turn their civil marriage into an eternal one once the ordinances were available to them. This logic (as well as portions of D&C 132) suggests that righteous men are rewarded with a multitude of wives in this life and the life to come. Once polygamy was openly practiced, Zina could not continue to live as a wife to two men. 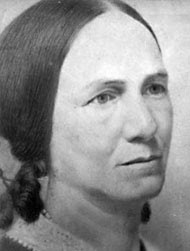 She was married to Brigham Young while pregnant with Henry’s child, and in the same ceremony, she received ratification of her earlier marriage to Joseph Smith for eternity. At this point, her civil marriage to Henry was considered cancelled. It is unclear if Henry and Zina initially fully understood the implications of this new marriage. Zina was leaving the bounds of a cozy and personal domestic life with her husband of 7 years and 2 children to enter Brigham’s “quorum of wives”, with the relationships she would build with her sister-wives to provide her the emotional fulfillment she lacked in the formal and distant relationship she had with Brigham. Henry was forced to give up the love of his heart, despite his faithfulness to God and his servants. Although Henry went on to marry other wives, his heart remained with Zina. Shortly after her marriage to Brigham, Henry wrote to Zina while on a mission to England. “Zina I have not forgotten you my love is as ever the same and hope it will continue to grow stronger to all Eternity worlds without End when familyes are joined together and become one consolidated in truth…kiss my Little ones and tell them about there father” (p. 154). Although Henry continued to profess his belief in Mormonism and was considered a Mormon in good standing, he was disfellowshipped by the Third Quorum of the Seventy in early 1851. The reasons for this disciplinary action are unclear, but stories among Henry’s descendents suggest that he was disfellowshipped because Brigham disapproved of his continued communication with Zina. I include here a large section of the last known letter from Henry to Zina, sent a year and nine months after his disfellowshipping. I find it tragic and heart rending and it is clear that he is in a great deal of emotional distress over the dissolution of his marriage to Zina. “O how happy I should be if only I could see you and the little Children bone of my bone and flesh of my flesh I mean all I would like to see the little babe…I am unhappy there is now [no] peace for poor me my pleasure is you my Comfort has vanished the glory of day has flead like the fog before a pleasant morning my youthful days are yet in my mind yes never to be bloted out I have had a good Dream about you and the little ones I have imagin myself at home with you and the Little Boys upon my kneese a singing and playing with them what a comfort what a Joy to think uppon those days that are gone by O heaven bless me even poor me shall I ever see them again. I think of you very often Zina ar you happy do you enjoy your life as pleasant as you did with me when I was at home with you and that children when we could say our prayers together and speak together in toungs and Bless each other in the name of the Lord O I think of those happy days that ar past when I sleep the sleep of death then I will not for get you and my little lambs I love my children. O Zina will I ever get you again answer the question please If you at Liberty to answer the question write me soon as you get this my troubles her ar great greatere than I can bar [bear]…I have heard that I was Cut off from the Church for what was I [cut off] Oh how I do feel about it never did I do eny thing worthy of being cut off always have I defended this cause it Belongs to God the Father…kiss all the Children for me I would send something to them but it may be like the rest of my letters never get ther I have not forgotten my promis to my dear children” (p. 198). In the 5 year period following Zina’s marriage to Brigham, she apparently wrote Henry only once. It is unclear whether she, on her own, decided that this would be the best course of action or if she was obeying instructions from Brigham Young. According to Jacobs family tradition, in the mid-1850’s, Brigham noticed the toll that Henry’s letters were taking on Zina and he subsequently forbade her to communicate with him at all, and for two decades there was no communication between Henry and Zina, with minimal contact between Henry and his sons. How does this story end? Henry married three more times, but each wife divorced him. He settled in northern California, making a living with chicken farming. In 1877, he welcomed a visit from his eldest son, who recorded “he burst into tears as he threw his arms around my neck and thanked God he has seen me again in the flesh.” Suffering from kidney disease, his two sons moved him back to Utah and according to Jacobs family tradition, Zina let Henry stay in her house where a hired nurse cared for him until his death in 1886. There are no accounts from Zina about this event, and it is unclear if she also lived in the house and what communication existed between them. I haven’t fulled processed my feelings about this polygamy story. In general, though, I find it tragic and depressing. It is clear that Zina chose to marry Joseph Smith, and then felt she must marry Brigham Young as well, and there is no historical account of any regrets from her. She publicly and actively defends polygamy, and throughout her life, she elaborates on the blessings that come to those who practice it. Henry Jacobs, though, seems more the innocent bystander in this whole account and I have thought about him often since learning his story. I wondered why Joseph Smith, with Emma by his side, as well as other plural wives, needed Zina as well. Should Zina have consented to Joseph when he first approached her, thus leaving Henry to find another path and giving him reprieve from all the sorrow that came to because of Zina? It is likely that had she never married Joseph Smith, her public life would have been very different. As a woman tied to the highest ranks of Mormon leadership, she had the opportunity to lead the Relief Society as its general president. She was actively involved in a women’s health initiative in Utah. And she participated in a great deal of Utah’s early economic development, including heading up the silk cooperative. But, perhaps these achievements came at the expense of an emotionally fulfilling and happy domestic life. I have found no satisfying conclusions. Previous story What is Women's Liberation? Oh, poor Henry. The excerpts from his letters to Zina make me feel terrible for him. He must have been so confused. In a church that places so much emphasis on families–to have his family ripped from his hands in such an unjustifiable (and, frankly, cruel) way must have been particularly painful. My first thoughts after I read your post were of the “Lost Boys”–the young men that are forced out of contemporary polygamous communities when it becomes obvious that they are not “leadership material” (read: worthy to be polygamists). The situation is, apparently, also informed by the statistical reality that there aren’t enough women for all the men to have multiple wives. The existence of these young men would also serve to support your thesis, Michelle, assuming that we can even draw parallels between 19C and modern polygamy. This story made me want to cry. As long as things are theoretical, I can live with certain aspects of church history–these men weren’t perfect, polygamy was messed up, blah blah, but that doesn’t necessarily mean x or y isn’t true, etc.–but the cruelty and suffering of these real people are more than I can stomach. I’m going to be angry at God and/or the universe for a while now. When I read this part I was reminded of the Mormon legend where a young woman (a recent convert, normally) is getting a Temple Recommend interview for her wedding and starts crying. She confides in the Bishop or Stk Pres. that she doesn’t really want to marry the guy but her told her that he had a revelation confirming that she’s supposed to marry him. The leader then tells her that she is entitled to personal revelation, and he doesn’t have authority to recieve revelations for her and she doesn’t have to marry anyone she doesn’t want to. The scenario takes on a slightly different twist when the suitor in question is the the Prophet and actually *does* have authority to recieve revelations for her. Was this one of those times when Joseph was “only a prophet when acting as a prophet”? and can I even ask that question. Hard stuff. I know this is a thread about polygamy, but this line in Henry’s letter is what jumped out at me. Evidenced that they “blessed each other in the name of the Lord.” I’m glad polygamy is gone, but I’m sad we as women have also lost the right to give blessings. Maria, I have thought so much about Henry since reading their story. I hope that by now, everything has been worked out in a way that is best for all involved. Do you have any idea how contemporary polygamous communities choose the boys that will be future leaders? Is it passed down to current leaders’ sons? Or to oldest sons? Interesting connection. Starfoxy, I thought about that urban legend/cautionary tale quite a bit while reading the book. The authors record several instances of women pushing back, saying that they needed their own spiritual confirmation of plural marriage before they would enter into a marriage with Joseph. And it seems that many of them did receive a spiritual witness. Zina doesn’t record much of the spirtual conviction she received, simply saying she obtained a “testimony for myself” that God had reestablished the order on the earth. In another source, many years after her marriage, she talked about “dreams that I could not account for” as an additional witness to her that this was the Lord’s work. Starfoxy, I forgot to mention what I see is a glaring contradiction to these women’s spiritual witnesses: Emma Smith. I have no doubt that she prayed and fasted and desired to receive her own converting experience to polygamy, but it seems that she never had one. Or if she did, it didn’t “stick.” In my perspective, her personal witness seems to be the most important, of any, to receive. Perhaps this was a side effect of the shabby way that Joseph implemented the policy with regards to her: in secret and marrying her friends. Once she found out, it was that much more difficult for her to find peace about it. 1. Zina was never meant to be Joseph’s wife. Thus, it’s Joseph’s fault since her pressured her to marry him. Or it’s both their faults since he pressured and she agreed. 2. Zina: Joseph was right and Zina should have accepted him the first time he asked. In this scenario, the blame falls squarly on Zina’s shoulders, since she would have never married Henry if she had first married Joseph. 3. What about Brigham? I wondered why, as a righteous man, Henry couldn’t have just kept his marriage to Zina after Joseph’s death. I don’t know why the proxies for Joseph had to be apostles. 4. Henry??? I can’t think of any instance where Henry should take the blame for what happened. The one thing that’s solidified in my mind in recent months is that polygamy was fraught with mistakes in its implementation. Joseph was focused on the restoration of all things, but the practical details eluded him. He didn’t talk to his counselors or the apostles about it, but started its implementation on his own, in secret. I feel like he was setting himself up for failure. And it also seems that there were no set policies about what to do in unusual circumstances: what to do if a woman was already married. The justification that Brigham later gave that I cited earlier, about more righteous men having the upper hand, seems to me like a post-justification for questionable behavior. amyb, The first three Zinas were renown and prolific in their use of spiritual gifts, especially in the speaking of tongues. I’m not sure what happened with the fourth Zina (born in 1888), but she never seemed to have an interest or ability to use these same spiritual gifts. The second and third Zinas were also both involved in midwifery, and there is a lot of description of their prayer circles. I love the idea of gathering together as a group of women to give a blessing to another woman about to birth a child. Wow, Michelle. Thanks for posting this. Poor Henry. Poor Zina. What a mess early polygamy was. While I’m not a huge fan of BY, I’m glad that at least he regulated it and tried to clean it up. No more sneaking behind spouses’ backs and marrying friends’ wives and husbands. I think the most difficult part of the story for me was after Joseph’s death and, although it is heartbreaking that Henry and Zina couldn’t be together again, even worse to me is the feeling of ownership surrounding her marriage to BY …that she is being “kept” for Joseph like property, by BY. I have such a love/hate relationship with these stories. They are so interesting, but I hate they are a part of our church’s history and intertwined into our doctrine. Caroline, I think that while Joseph was a visionary man, he was not necessarily a good “manager”. In addition to polygamy, I think his financial schemes also show this. I get the sense, though, that BY was much more practically minded and able to implement the details of programs. Ironic that bringing polygamy out the closet was what started it rolling down the hill towards being prohibited. Jen, You should definitely put this on your list to read. I liked it better than the Emma bio, and the change in these women’s lives over time as the context changed is fascinating. I agree with you about the ownership language. That exists quite a bit in section 132.